In a sentence, running the Sun Mountain 50k on May 16th was one of the most amazing experiences of my life. I learned a great deal about my physical and mental toughness, and I also just enjoyed the hell out of almost every step of the race. I feel incredibly lucky to be strong and healthy enough to be able to run a 50k through some of the more beautiful landscape I had ever seen. 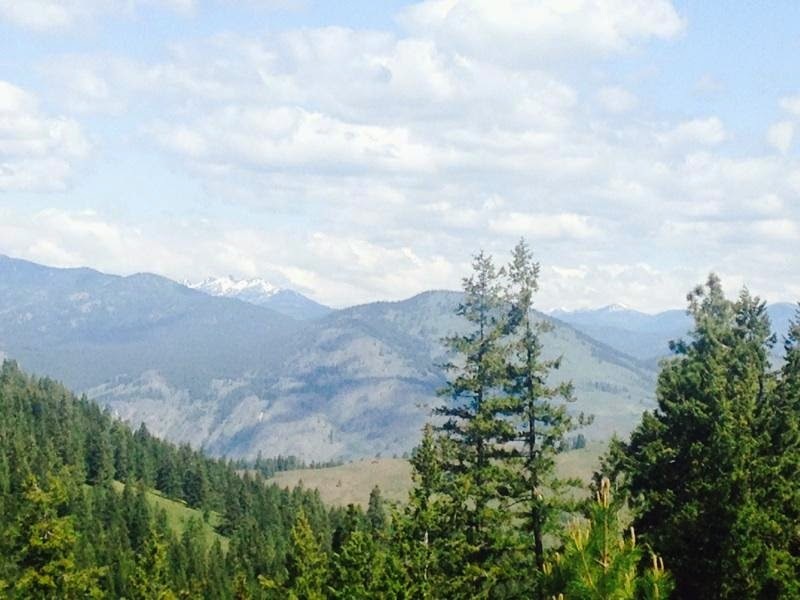 My family and I left our cozy cabin in Mazama to drive to the Chickadee Trailhead in Winthrop for the 10:00am start. Turns out I over-estimated things a bit, as we arrived pretty early. Of course my life motto is "better early than late!" so I was glad that I had more than enough time to organize myself, pin on my bib, chat with friends, use the porta potty, eat, hang out, and feel ready for the day ahead. Things felt great, and I was more relaxed and excited than nervous. 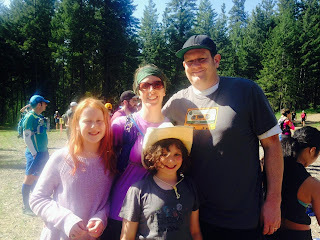 With my wonderful family before the race. Picture by Stacey. Selfie from Stacey before the race. The race began and I was the last person across the start line. My Garmin wouldn't catch a signal so I held back hoping it would find one before I started running. No luck, however, and I was about .3 miles in before it kicked in. I was surprised by how fast the field was moving, about a 12:00 min/mile pace and I remained the last person for the first two miles! The panic briefly struck as I wondered if I would be left in the dust for the entire thing-- that was way too fast for me to run this race. The double track and dirt roads in the first section of the race were so dry. They kicked up a lot of dust and dirt. My feet, ankles and calves were starting to become covered with a dark layer of dirt and my shoes were collecting gravel. The trail was so much different than the trails I train on near home in western Washington. Even after many days without rain our trails remain damp, even muddy, under the protection of dense forest cover. Luckily the field slowed down and I eventually caught up to my friend Stacey and some women from the High Heels Running Group. We ran together for a few miles, alternating between tree cover and open areas of sunflowers with views for miles. 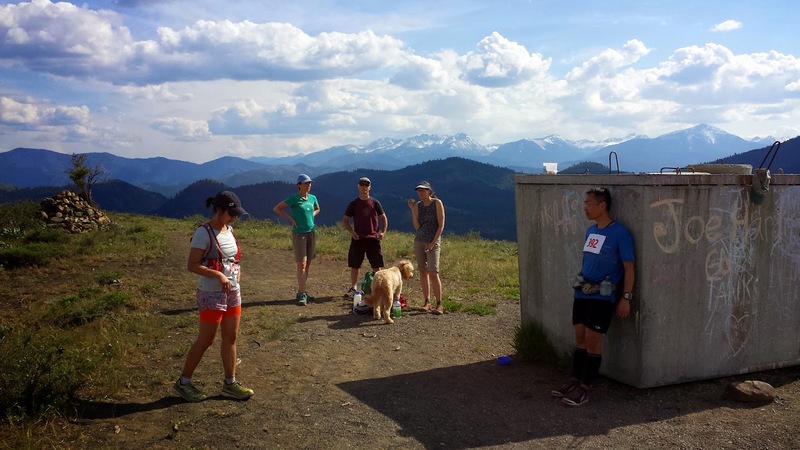 We remained a chatty group until we split up at the first aid station at Thompson Ridge. The volunteers were amazing and there were plenty of delicious things to eat and drink. I grabbed some grapes and an s-cap (salt capsule), sat down and dumped the gravel out of my shoes, and headed out of the aid station with Stacey. 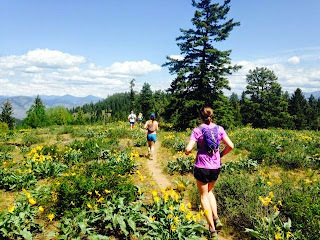 Running with the HHRG ladies. Photo by Dawn. Views for miles. Photo by Stacey. Fields of sunflowers. Views for miles. Photo by Stacey. Coming out of the aid station I was feeling pretty good, settled in to the run, and excited to see what the rest of the course would bring. The sun and heat were definitely present, but not stifling like I feared. My other big concern of the day mercifully never came to fruition: rattlesnakes. Didn't spot (or hear) a single one, whew! 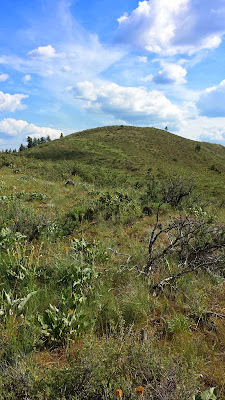 We tackled a long climb up to the first aid station, but it was more gradual and runnable, not as hard as I expected it to be. After the aid station it was uphill a bit more, then downhill for a while after that. I didn't love this section of the course quite as much. The downhill was too technical for my wimpy sensibilities. I lost Stacey, who bombs downhills like a pro, and cautiously skidded my way down. About 10 miles in I decided it was finally time to find a tree for an on-the-go pee spot. Abandoning my pride and crossing my fingers, I stepped about a foot off the trail behind a tree. Of course several runners immediately came by. A bit before the second aid station. 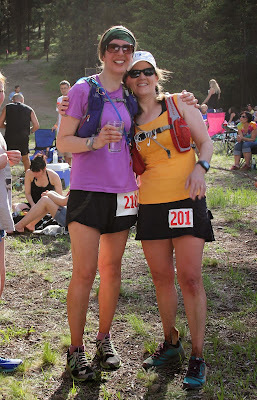 Once again I caught up to Stacey and we made it to the second aid station at Homestead. I had a drop bag there with everything I thought I might need but ended up just re-applying my sunscreen and calling it good. This aid station had watermelon, which tasted better than anything I could ever imagine and left me contemplating how to fit a whole one in my running pack. One of the many amazing volunteers helped me re-fill my water bladder, but it was a pain to get situated back in my pack. Annoyingly, I forgot to grab any food for the road or take my fig bars out of my drop bag like I had planned. Stacey and I left the aid station together but quickly became separated: I had a fire lit under my feet because I knew I would see my family soon, as they were waiting for me at Sun Mountain Lodge just a little ways up the course, but unfortunately Stacey wasn't feeling 100% at that point and hung back. The next couple of miles were amazing. I felt like I was floating and indeed busted out some of my fastest miles of the race. 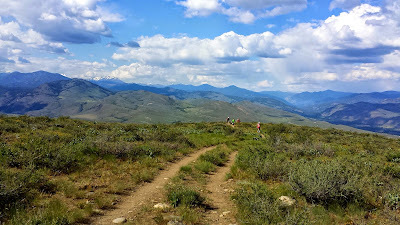 The trails were mostly under tree cover and when we emerged were treated with incredible views of the Methow valley. And then the deathly ascent up the back side of Sun Mountain Lodge began: almost a mile straight up wide open dirt in the hot sun. It was absolutely miserable. I pushed as hard as I could, one foot in front of the other without stopping, as I was 99% sure I wouldn't be able to start again if I did. At the top it was barely a shuffle across the lodge property to my family. It was amazing to see them. And God bless whoever installed a faucet and drinking fountain at this spot. I stopped to drink and soak my head with the cool water. After lingering for a couple of minutes it was time to move along. It was a tough point in the race for me, there was a long ways to go, my legs didn't yet feel like moving again after that climb, and I didn't want to leave my family. Cooling off at the water fountain. Photo from my husband Matt. But the race must go on! There was a lovely descent for about a mile and a half and then . . . I hit, literally, the thing that almost ended my race. 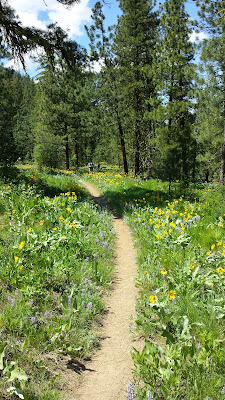 The trail in this section was quite narrow and the plants were growing over the edges. My right foot smashed in to what felt like a giant rock and I lurched forward, thankfully catching myself before I face-planted. Immediately my adrenaline surged but then I realized my smallest two toes were in bad shape. They hurt, a lot. I couldn't run. I slowed to a shuffle and a few people passed me. Then the tears came. I cried my way down the rest of the section of trail, wincing with pain every time my right foot hit the ground. I found a log to sit on, deciding I needed to take off my shoe and sock and assess the damage. Another runner, my trail angel!, came along and asked if I needed help. I started sobbing and said yes, I thought I had broken my toes. She explained she had experience as a nurse and said I needed to tape them together. Another runner, my second trail angel, appeared, a gentleman who had tape and a scissors in his pack. The first runner taped over my socks (because I had on my beloved injinjis, which are toe socks). This was especially amazing of her because her legs were cramping up when she bent over. It hurt even more as she taped them (which she warned me would happen). I thanked them both and waved them on their way as I dug some pain killers out of my pack (note to self: refill painkiller and add tape to first aid bag!). It was then more hobbling/shuffling/crying for another mile or so before I realized I could likely walk the rest of the race without getting cut-off. I didn't want to walk my race, but it was better than DNFing. The one benefit of walking for a bit was getting a chance to chat with other runners. Some familiar faces caught up and said hi. It took my mind off of my foot a little bit. At the last aid station at Patterson Lake I hoped to find someone with medical training to look more closely at it, but they didn't have anyone. Since I wasn't feeling as much acute pain, there was only one thing to do: onward and upward. At the Patterson Lake aid station I made another minor mistake, which was not re-filling my water or taking any non-gummy snacks. Somehow everything in my pack was chews or gels, which I do not like eating very much of on long runs. 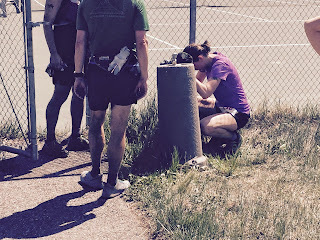 Forcing myself to choke that stuff down for the last miles of the race wasn't the most fun. I missed my fig bars and cookies! Fortunately I was able to make it the entire race with good energy levels and zero tummy issues despite lacking my preferred fuel. Coming out of the aid station I was able to run a bit before the course turned uphill again. 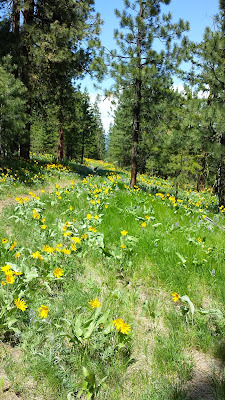 This section was very technical and overgrown, so it was all walking for about two miles. The views were breathtaking as the course wound it's way up a mountainside. 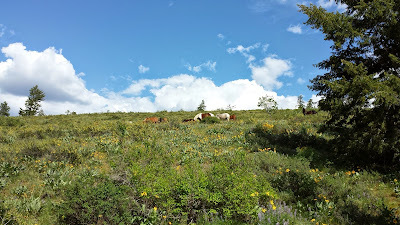 A herd of horses wearing jangling cowbells grazed off the trail. Eventually, we came to a step ladder that brought us up and over a fence. Navigating the ladder was a bit tricky on tired legs! It was about this point in the race that I finally realized how cruel James Varner, the race director, really is. 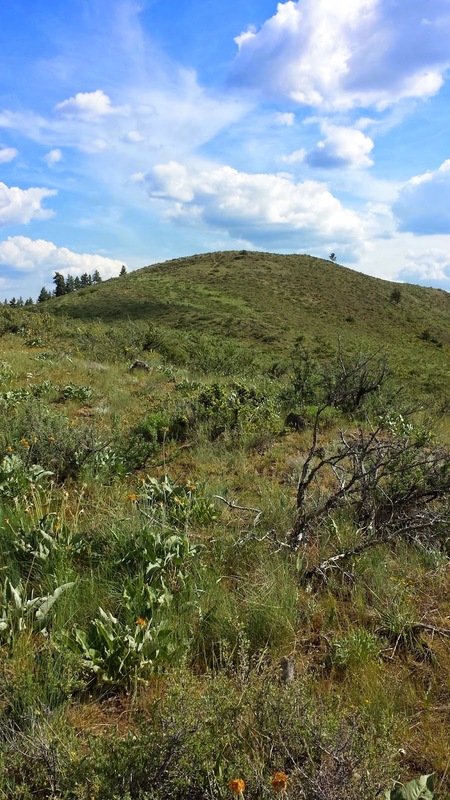 The course went up, and up, and up, and then when it appeared we would be done with the up, the final push to the top of Patterson Mountain began. We just had to climb to the top, turn around, and come back down. It was, in a word, insane. 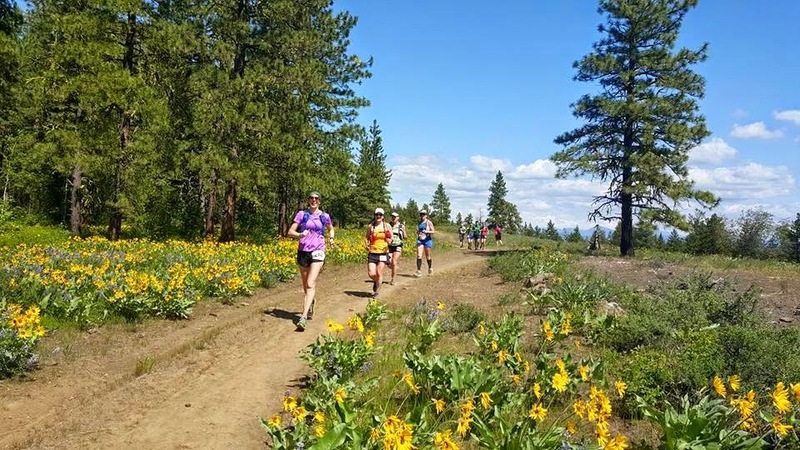 Somehow it didn't end up feeling as bad as the climb to Sun Mountain Lodge, even though it was longer and later in the race. Tough to see, but there is a trail and teeny tiny runners heading up this climb. Hanging out at the top of Patterson Mountain. View from the top. My Garmin says the climb was 1200 feet in 2 miles. I was dreading the downhill, sure that it would kill my toes. Tucking in behind a group of three women, it felt like we were moving at the perfect speed. The pace was quick but manageable and most amazing of all-- my toes didn't scream at me! I followed the group for a good chunk of the downhill until they stopped for a break. Down and down towards Patterson Lake I continued along on my own, crossing a road about a mile from the finish line. One guy passed me, but otherwise I was alone on this section. 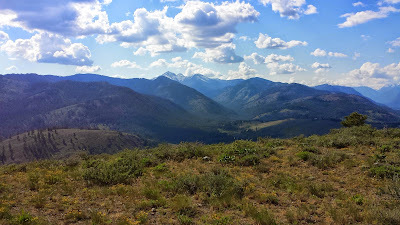 The energy I felt on the way down Patterson Mountain had disappeared and I was once again shuffling. Then speed walking. Then I turned down Chickadee trail and could hear the cheers from the finish line off in the woods. Time to run it in. I turned a corner and saw a few people cheering, and another person shouted "100 yards to the finish!". I didn't think I would cry, but the crowd and cheering and finish line was amazing. I blubbered for a second, hugged James Varner, and began searching for my family. With Wendy from HHRG. Photo from Wendy. I was disappointed that my family and I mis-communicated a bit about my finish time so they were not there to see me cross the finish line. All was well, however, as we met up a few minutes later, grabbed food (wood-fired pizza, yum!) and settled in to watch more runners come in. It was so fun to hug and congratulate friends and soak in the energy of the day. Then the mosquitoes came out in full force and it has time to head back to the cabin, haha. I am proud that I crushed every single one of my race goals -- finish the race, feel strong, and enjoy it, all hopefully in seven hours (My official time was 6:59:31!). The next morning, as I slipped on my running shoes to head out in the backyard of the cabin and take in the beauty of the Methow Valley, I just wanted to get right back on those trails. The "race amnesia" had already set in, I was ready for round two! My legs felt decent afterwards, and despite the awkward compensations I was making for my hurt toes, I didn't throw anything off in the rest of my body. Now a few days after the race, my toes seem okay, thankfully not broken as far as I can tell. Whew! This 50k 100% fueled my desire to run more, and longer, distance races. Hopefully there will be more Rainshadow Running races in my near future! Edited on 5/26/15 to add a link to this amazing video of the 50 mile course. It was shot on a GoPro by Mark Cliggett. I strongly suggest you watch it, and if you haven't already run the Sun Mountain race, you will want to after seeing the video! Oh man!!! What a wonderful race! I am SOOOOOO happy for you. That race course looks beautiful too! 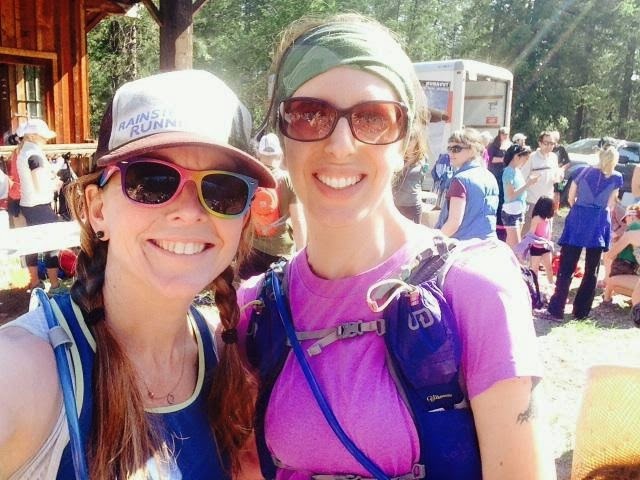 You're an ultramarathoner now - how cool! Congrats! Sounds like a great experience for you! I ran the 50 miler and can attest to the cruelty of that last climb up Patterson Mountain. I might have cried haha. Great report!! This is for sure one I'll run again next year too, even with those cruel hill climbs. Congrats! !